older leaves are best when boiled in 2 changes of water and/or with midveins removed. roots are best when collected in spring/autumn, peeled, sliced and cooked in 2 changes of water with pinch of baking soda. seeds with the parachute removed can be eaten or ground into flower. a serving of dandelion greens contains the same amount of calcium as half a cup of milk. 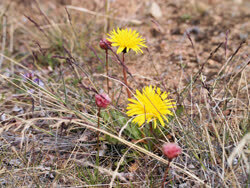 is a good source of potassium, vitamin A, and vitamin C.
grows in a wide range of terrain, look for dandelion in disturbed/cultivated soil areas.